The Internet of Things (IoT) is a predicted eventually when a vast number of everyday objects are augmented with internet connectivity and accessory capabilities. They keystone to these IoT device features is the ability for sensors, controllers, actuators, and displays to communicate through the common platform of the internet. As hardline internet, such as through Ethernet or fiber optic, isn’t viable for many applications and environments, a more flexible alternative is to use wireless communication methods between an IoT device and a wireless hub. The ability to operate without a physical wired internet tether is extremely desirable for many applications. Some examples included patient monitoring for medical applications, wireless beacons in metropolitan store fronts or retail spaces, and with industrial applications interfacing between a large number of coordinating machines. As the diversity of wireless IoT devices is extensive, so are the wireless standards/protocols and methods of wireless communications used with these emerging devices. This blog will provide a brief overview of wireless standards commonly used, or considered, for IoT applications. The majority of today’s common wireless standards used with IoT applications are at 2.4 GHz, where the ISM band that facilitates Bluetooth, Zigbee, Thread, WiFi, and other standards. 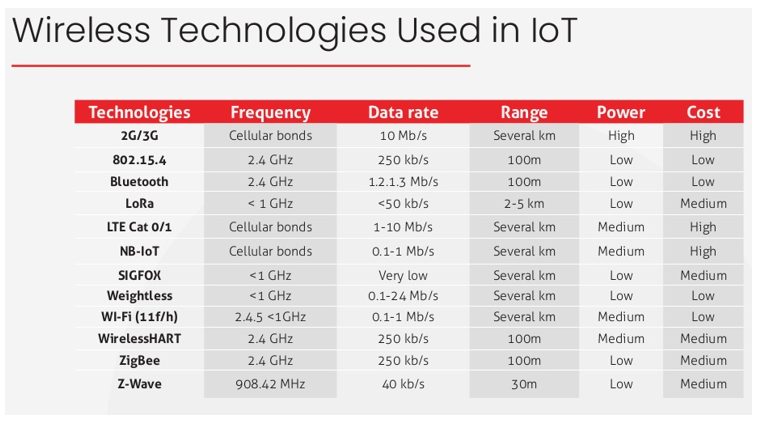 Virtually all wireless IoT applications use frequencies below 6 GHz, some of the highest operating frequencies for IoT being 5 GHz WiFi and high-band cellular. However, future development of IEEE 802.11ah, 802.11af, or other TV White Space (TVWS) frequencies may allow for wireless IoT applications in non-cellular bands between 400 MHz and over 700 MHz (United States). The low frequencies of TVWS open up doors for low-power and still comparatively long range communication. There are many considerations for choosing a particular standard over another. Each standard differs somewhat in the infrastructure, design resources, vendors, module size, difficulty of certification, and licensing cost. Moreover, the various wireless standards also operate on a wide range of frequencies, use different and sometimes unique modulation methods and protocols, have a wide range of maximum output power restrictions, power efficiencies, effective ranges, networking types, interference concerns, and complexity of design/installation. Also, each country or region regulates radio frequencies in unlike ways, though there are some common wireless standards shared between some countries and regions. Hence, some wireless IoT devices operate in unlicensed bands, where others are licensed and require additional costs to operate in those bands and may be further restricted in location and operation by licensing agreements. Some wireless standards/protocols themselves are proprietary, and the hardware for the devices must be purchased from a licensed distributor, or IP licensing may be required. There are also wireless standards used for IoT that are open standards, such as LoRa and Thread, and are developed as an effort by many industry partners, experts, and associations. After a wireless standard is selected an IoT OEM then needs to select devices that are certified in that standard, or build their own compliant devices. These devices are often communication chips, or microcontrollers/microprocessors (MCUs/MPUs) with integrated communication features. To implement a wireless standard, an OEM then needs to design such a device into a circuit along with the associated RF components, antenna, and interconnect that are compliant with the standard. Additional certification and compliance is often necessary to meet countries emission and susceptibility of electromagnetic interference (EMI), known as electromagnetic compliance (EMC).